Sorry for the brief hiatus of blogging! Things have been very busy around here. Plenty of uni related stuff, house hunting and very soon (tomorrow!!!) to be house moving, colds and all kindsa fun stuff. Boatmurdered is on a brief hiatus at the moment. It's tough getting Tom and I together to work on it. Mainly due to our uni having an amazingly spaz idea of taking all the pens away from the wacoms at uni and making us either have to buy our own or go through a delayed and tedious rental program. COOL! I'll work on getting stuff together again real soon. I've still been playing heaps of Dwarf Fortress though! 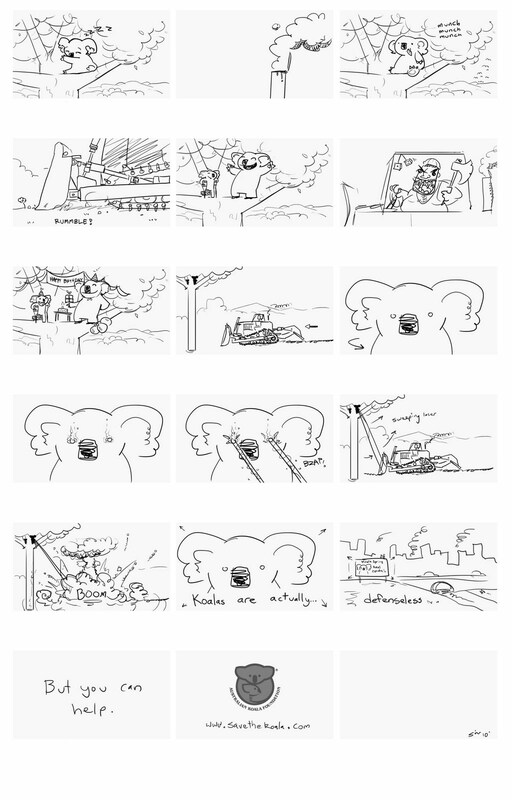 I'm in a cool group of 2D animators to make a non profit commercial for the Australian Koala Foundation. We had a pitch process to the client and my concept got picked! I finished the storyboard v.1 today. The whole group got to go visit proper Koalas last friday but I was in bed with a crazy fever and sadly missed it. ALMOST BETTER! As you can see, they wanted something a little bit off beat and "virally", like this sickness I have! AMIRITE?! I've got a BILLION other things to do, including an audio analysis of a scene from Empire Strikes Back, an abstract short image sequence video, a huge life drawing landscape with figures, a green screen sequence, this Koala advert and many more future assignments! On top of that I'm doing some freelance stuff for a Scooter Apparel brand (sticker designs) and a sequence for a skin care cream ad thing. Plus I want to start some of my own projects soon. Jesus writing that all out makes me just wanna drop dead now. I've finally started reading LOTR too... That has been like a life goal. I just destroyed the Hobbit and figured it has given me the momentum to dive in. I've tried like 3 times in the past. I wish that was my name in those credits and I had actually made it.